This past weekend I went back to my former church for a celebration of 25 years of music ministry for Audrey, the music liturgist at the parish. For many years I had been a very active member of the music ministry and Audrey became a very good friend. She is someone who lives a grateful life and always counts her blessings. It was wonderful for her and her family to hear from so many about what a blessing she is to them. 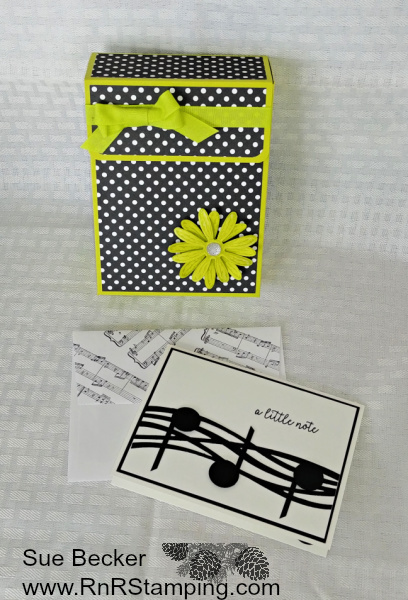 As a small token of appreciation, I made a set of 10 note cards and a fun box. The music staff is from the Swirly Scribbles Framelits. I used a sentiment from Butterfly Gala. The envelope flap was randomly stamped with Sheet Music. I love the Daisy Punch; it creates the perfect spring embellishment. I messed around with measurements for the box and wound up with 2 pieces of card stock cut at 9 3/4" x 8 1/2, scored at 2" on 2 long sides and 1 short side. I glued those pieces together and made a flap for the top that measure 6 1/2" x 4", scored at 2 1/2" and 4 1/2" and glued the 2" panel to the inside of the box. Leave a comment if you need clarification on any of that. Along with the box of cards, I included one of my home made cinnamon breads. The package smelled heavenly! It's especially fun to give a gift when you know it will be appreciated. To receive weekly tips and techniques, be sure to sign up to receive my newsletter in the bar on the right side of my post. Lovely card and box! How did you make the music notes? Miss Emilie, I used a 3/4" circle punch and a 1/8" sliver of Basic Black for the stem. The small oval punch will work too. Have fun!